After several difficult years and -22% on the gross casino games revenue between 2008 and 2010, there are however signs of economic recovery in the coming year. In practical terms, this represents €2 962 137 from tax revenue from the casino industry. €200 120 for occupation payments and €331 762 to contribute to artistic, touristic and associative development for the city. While the 2010 results were virtually stable compared to 2009. The first four months of 2011 show an increase of 4.41%, allowing Nice to maintain its fifth position behind Nice, Cannes, Antibes and Mandelieu. However this improvement is still considered fragile because if the 2010 turnover is down by only 1.46%, the gross product of table games is in free fall at -29.5%. This is a consequence of the absence of Italian customers with strong potential already noticed in previous years. This decrease confirms heavy losses in this sector. Slot machines display a slight improvement up 0.11% thanks in part to the opening of the outdoor terrace and a return of the poker clients. But the main asset of the casino remains the full restoration of the restaurant and his disco which in progress by 30.07%. The Brasserie Colombale can even boast a 41.94% increase in its clientele to 38,873 table covers. This tendency remains dynamic thanks to a €10 lunch menu that has ensured loyalty and a doubling of the number of customers. Artistic activity is however difficult to sell. If the dancing tea parties on a Sunday are still appreciated by seniors, the attendance is in decline. Free events organized by the casino with musicians and singers throughout the year are much appreciated. The collapse in casino game revenues has led to the postponement of non-strategic investment. Total payroll has decreased by 1%. 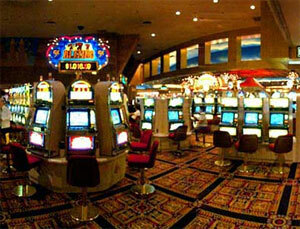 There are 133 persons who were employed at the casino in 2010. It is important to note that 92,48% of them are short-term contracts. This rate is down from 97,71% in 2009. For the year to come, the casino will continue to invest and to devote large sums of money to the marketing of its entertainment products.